Pink eye pretty much halted progress on the denim chambray Simplicity 2246 at the beginning of August. I was up to buttons and buttonholes but needed to have shorter sewing times. Shorter times means all or majority of buttons will not be done at once. I think I have determined that pink eye is an illness meant to drive one to boredom. I couldn’t read, can’t do beadwork (at least not the stuff I do), and had limited sewing times. Maybe it was a cosmic sign to vacuum up the bunny fur on the living room carpet. I hate to say but the bunny fur is still there until Monday August 18. The boredom didn’t motivate me to vacuum. Only after cleaning the bunny cage on Monday was I motivated to vacuum. I was in need of a simple easy project which didn’t require a lot of sewing and not a lot of detail work. I wanted something that I would be able to finish and wear to the KC Pinhead group lunch. Denim dress wasn’t going to be done just too much detail work. I figured a maxi skirt would work well. 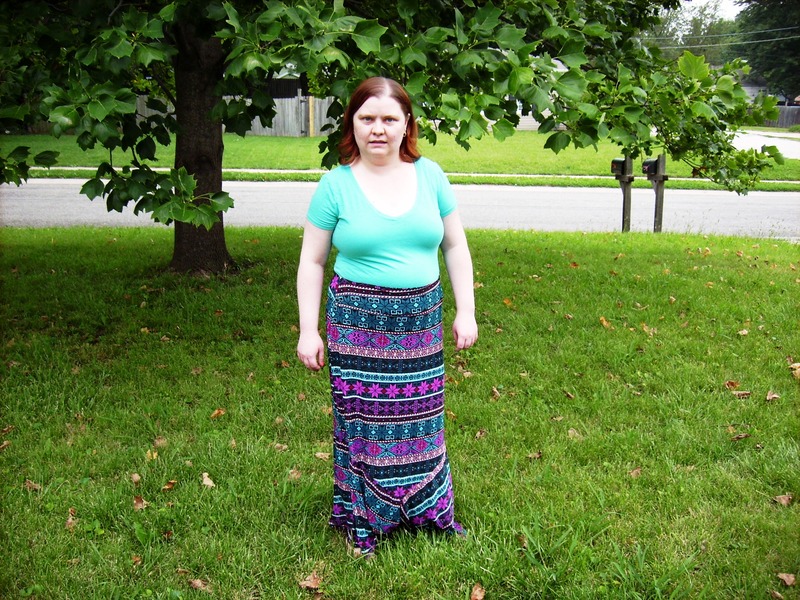 This is the beta version of the Ina maxi skirt pattern from Sewing Pattern Review website which is designed for vertical stripe knit fabric. I used a horizontal stripe patterned ITY poly knit for the skirt. I graded out 4 inches on the side seams of the skirt. It was probably more than what I actually needed. I didn’t include stretch of the fabric when I was grading for size. I changed the grain line for the godets. Since I had a horizontal stripe, if I had followed the pattern, my godets would have been vertical stripes. I used a narrow double fold hem at the bottom. I also took a little off the waistband. 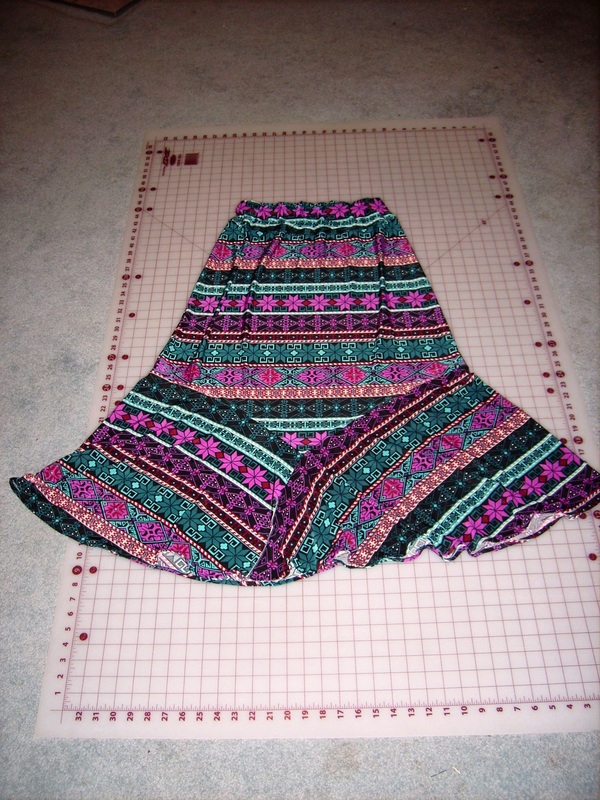 I added 1 ¼ inch elastic to the skirt. For it being a rough draft of the pattern, it was fairly easy to follow. First sew side seams, then short godet. After the short godet, put in the long godet. This is probably just me, but then I finished up the hem next. The following day I did the waistband and added elastic to the waistband. The pattern was just released on Monday August 18th. I haven’t bought the final draft of the pattern yet as I had just recently purchased a couple of American Girl doll patterns. Along with finishing up the chambray shirtdress (Simplicity 2246), the rest of the August sewing plans include Tilly & the Button’s Coco dress, and possibly By Hand London’s Anna dress. I will have to admit the pictures don’t make the skirt look as great as they should. I had to rush to get the pictures done on Friday evening before the rain as it was supposed to rain on and off all day Saturday. Also, I think the skirt looks better with the shirt un-tucked. But I tucked it in so everyone could see the waistband.